Our Hot Tub has been closed permanently. We apologize for any inconvenience. 100 Percent Non Smoking The Hampton Inn Branson on the Strip hotel is located on Highway 76 West /named Country Music Boulevard/ across from Dickens Gift Shoppe and in front of the Faith Life Church. The hotel is within walking distance of White Water and Factory Merchants Mall eleven music theatres and numerous restaurants. On the west side of town our Branson Hampton Inn features 109 hotel rooms with interior corridors and elevators. The amenity filled hotel rooms include coffee maker hair dryer iron and ironing board and complimentary high-speed internet access. Missouri guests can request a one room mini-suite that offers a king bed sleeper-sofa one person whirlpool tub microwave and refrigerator. Connecting rooms and cribs are also available. Sure to please the busy executive or leisure Missouri traveler Branson hotel guests will enjoy our complimentary On the House hot breakfast buffet daily indoor swimming pool and hot tub and fitness center. 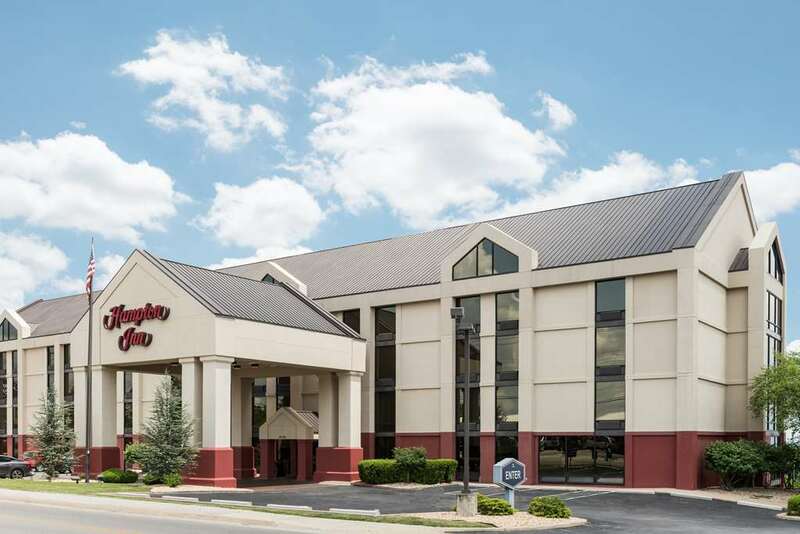 A guest laundry facility refrigerators rollaway beds and meeting and banquet facilities are all available for a nominal fee We love having you here in Missouri at the Hampton Inn Branson on the Strip hotel.